RCMP Veterans were saddened to hear of the passing of former Cst. 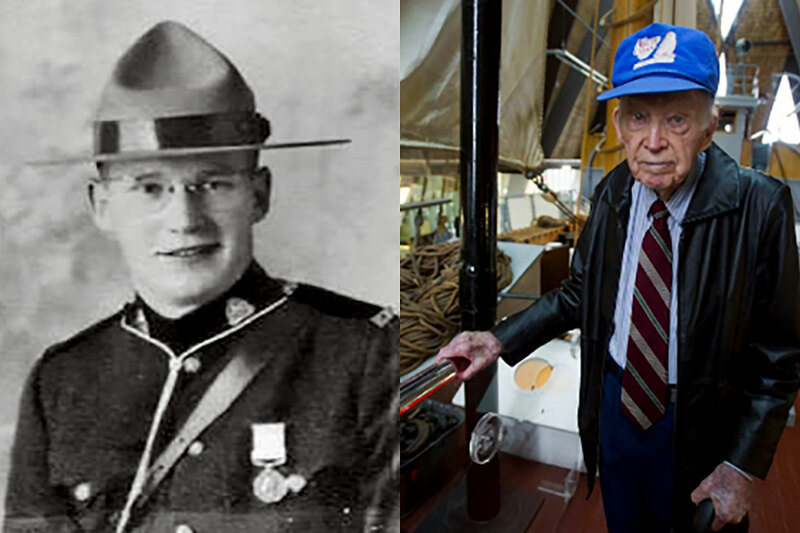 Eugene C. “Dean” Hadley, the last surviving crew member who served upon the St. Roch; an RCMP patrol vessel, during its historic voyage as the first ship to navigate the Northwest Passage traversing west to east in 1940 – 1942. Mr. Hadley died peacefully in his sleep on Friday, July 13, 2018 at the age of 98. Mr. Hadley first joined the RCMP in 1938 from his native Saskatchewan. In 1940, he was assigned to replace the radio operator on the St. Roch. He was the youngest crew member and served on the St. Roch during its historic voyage across the Arctic under the command of then RCMP Sergeant Henry Asbjorn Larsen. The St. Roch departed Vancouver on June 23, 1940, spent two winters in the Arctic, and reached Halifax on October 11, 1942; a 28 month voyage. Mr. Hadley discharged from the RCMP after the voyage and joined the Royal Canadian Air Force where he served until the end of World War II. After the war, Mr. Hadley studied engineering at the University of Toronto. He eventually began working within the aerospace industry. He worked for the National Aeronautical and Space Administration (NASA) during the Apollo space program and performed an important engineering role for NASA that significantly contributed to the success of its first manned mission to the Moon which culminated in a lunar landing in July 1969. Mr. Hadley later worked in the energy industry, designing oil platforms for extraction sites in British Columbia, and concluded his professional career as an entrepreneur in the fields of real estate and property management. In 1943, King George VI awarded Mr. Hadley and the seven members of the St. Roch the Polar Medal (Arctic). In September 2017, Mr. Hadley was installed in the Northwest Passage Hall of Fame as the first inductee in the Individual category. The St. Roch was designated as a National Historic Site of Canada and is on permanent exhibit at the Vancouver Maritime Museum. A special exhibit marking the 90th anniversary of the building of the St. Roch is currently running to the spring of 2019. Mr. Hadley chronicled his experience upon the St. Roch and his other professional pursuits within his 2008 book; What A Life! No public memorial service has been announced at time of this Last Post. The crew of RCMP Patrol Vessel St. Roch, 1940 – 1942 (L/R: William John “Dad” Parry #7756; Patrick George Hunt #12740; Eugene “Dean” Hadley #13013; Sgt. Henry Larsen #10407; Frederick Sleigh “Ted” Farrar #10607; John William “Jack” Doyle #11768; Myles Frederick “Jack” Foster #8406; George William “Sarge” Peters #12704). RCMP Patrol Vessel – St. Roch.